I grab hold of the first sign of spring and run with it. I'm always eager for the bright colors and sunshine that spring brings, plus that means Easter is fast approaching. I like to pull out my spring and Easter décor early so I can enjoy it for as long as possible. 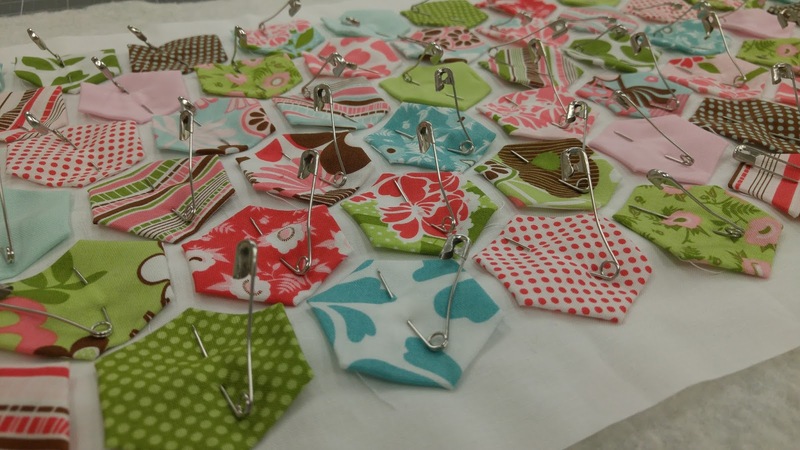 When I was packing projects for the quilting retreat a couple weeks ago, I grabbed an old bag of hexies I made last year. 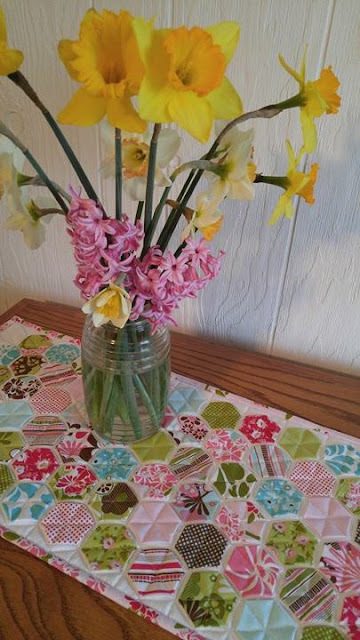 I thought it would make a bright table runner to set out for spring, and if I got time at the retreat, I'd start it. 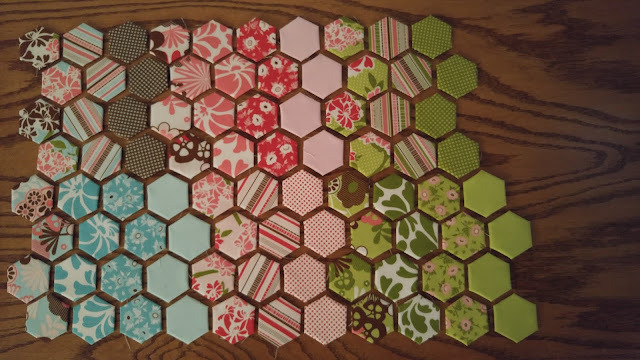 The hexies were some of the very first English paper piecing I did. I was inspired to try EPP hexies after joining Beth Helfter of EvaPaige Quilt Designs in her "Drop and Give Me Twenty" challenge to sew 20 minutes every day in February. It's an annual challenge, but in 2016, we had a family vacation planned smack in the middle of the month. I wanted to keep up with my commitment to the challenge, so I knew hand sewing (which I loathe!) was the only way to go. 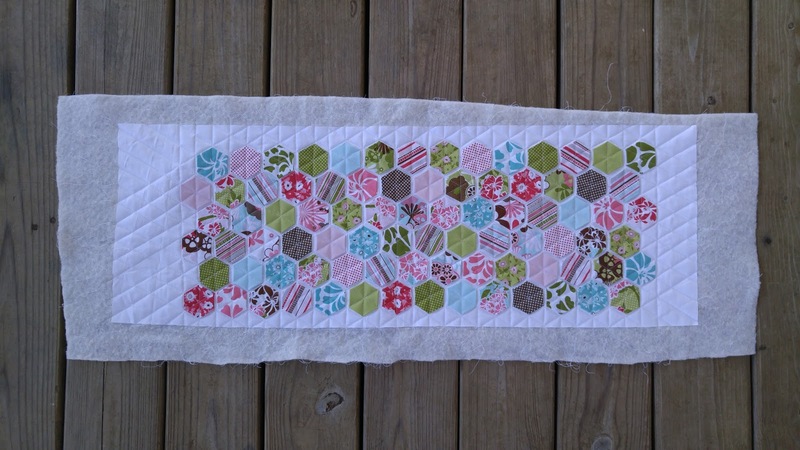 At the time, I had just watched a video tutorial by Nicole Daksiewicz of Modern Handcraft on how to thread baste hexies. It was worth a shot! I started by cutting up the ugliest charm pack I had - "Honeymoon" by Cotton + Steel. I cut the 5" squares into fourths to get 2 1/2" squares. Then I printed out 1" hexagons on cardstock that I then cut with scissors. 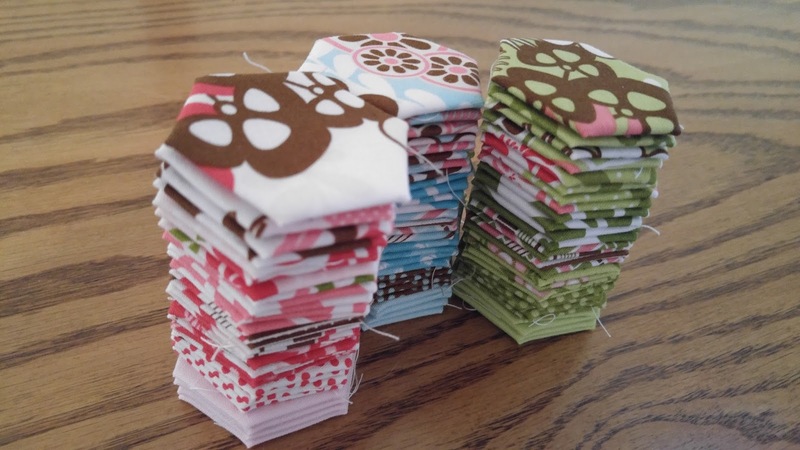 Since the experiment of making hexies seemed to work, I decided to cut up a good charm pack of "Dainty Blossoms" by Carina Gardner for Riley Blake Designs. Then the bag of completed hexies just sat and sat, waiting for me to pick them back again. Fast forward one year, I tossed the bag of hexies into my retreat bag. While at the retreat, I decided it was time! I layered Kona White fabric for the backing, cotton batting, and Kona White for the top too. Then I laid out the hexies "randomly" and began to stitch them down with my walking foot. (Am I the only one that has a hard time with true randomness??) 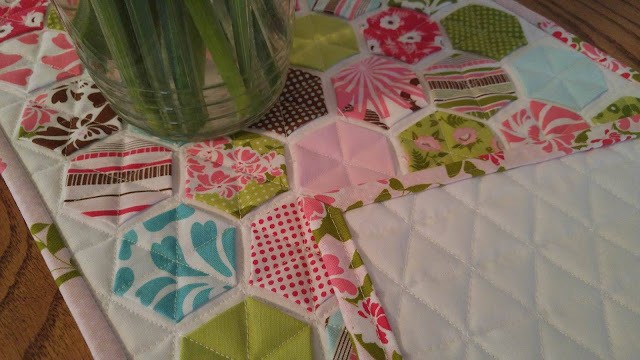 I used basting pins to hold the hexies in place since I was at the retreat and that's all I had. Normally I would use some school glue or basting spray on the back of the hexies. 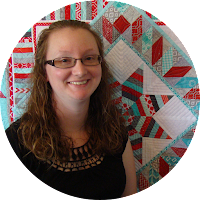 I had purchased some yardage of one of the prints in the Dainty Blossoms line from my local quilt shop, but forgot it at home. I had planned on using it for the backing, but changed that plan to make it work. Once home, all I had to do was make the binding and stitch it on! A quick finish now! Now I have a great spring table runner - a year in the making! 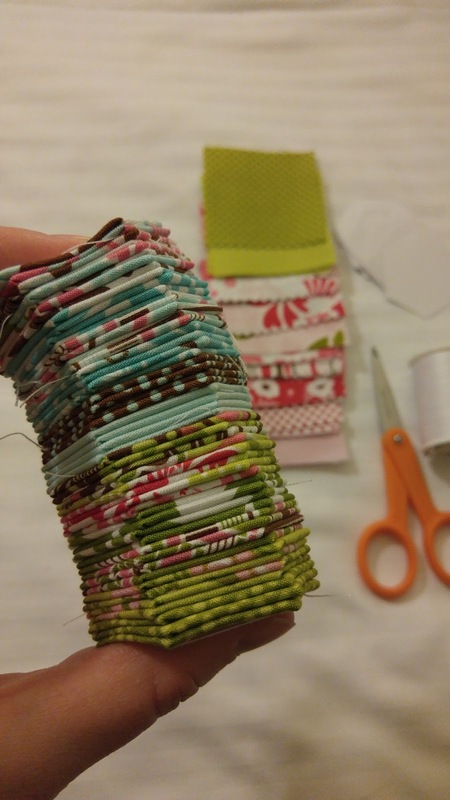 Linking up to Thank Goodness It's Finished Friday at Quilt Moderne, Finish It Up Friday at Crazy Mom Quilts, Finished or Not Friday at Busy Hands Quilts, Can I Get A Whoop Whoop? 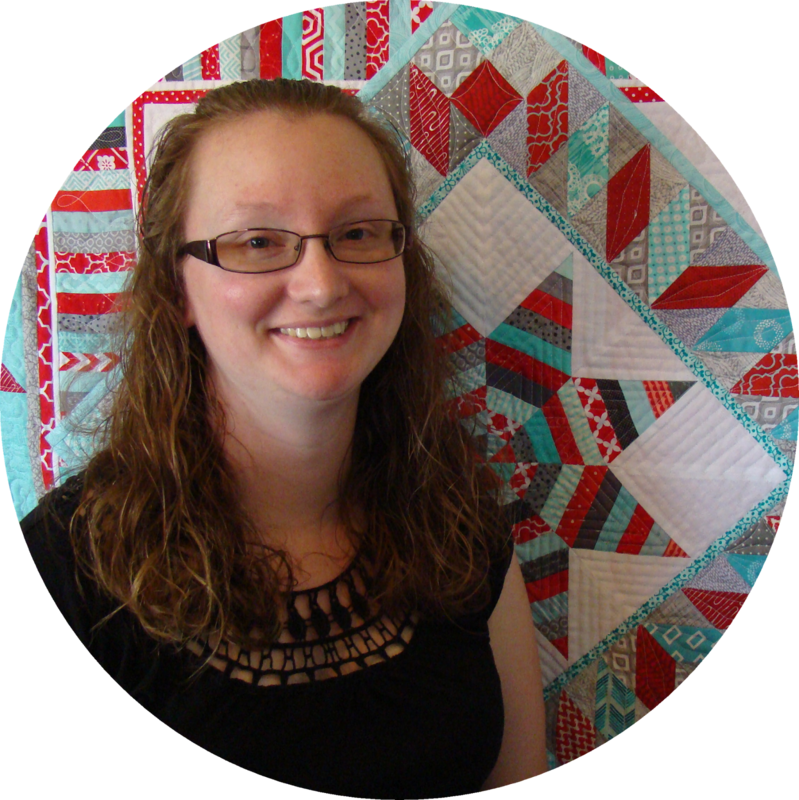 at Confessions of a Fabric Addict, and Show Off Saturday at Sew Can She. Oh, I love this! 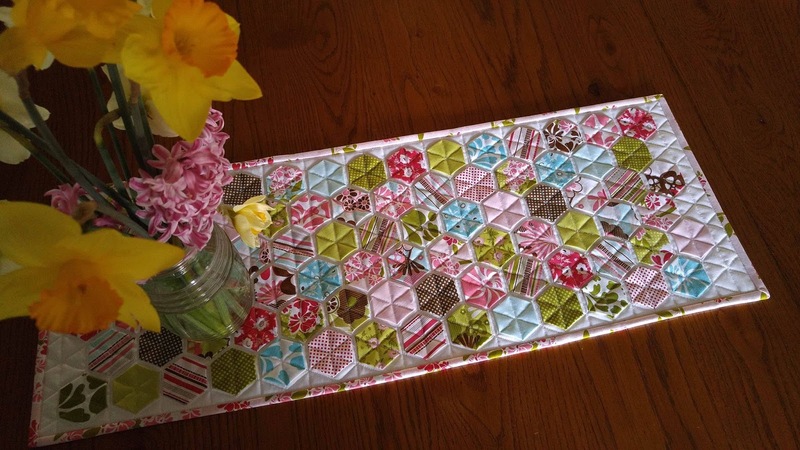 Your runner turned out so happy and bright with those hexies! I smiled when you wrote about using your ugliest charm pack, then went on to buy a full fat quarter bundle of it! 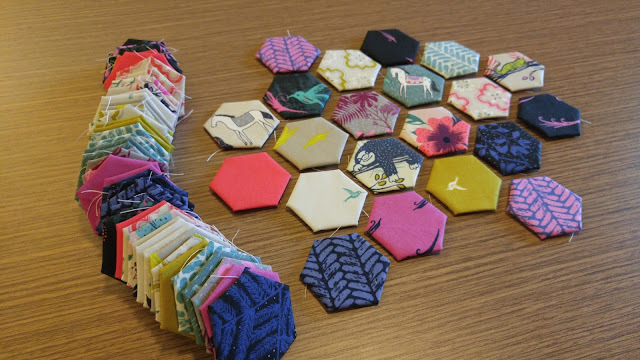 Making at least one hexie is on my to-do list for this year. I may become hooked! Love it!!! 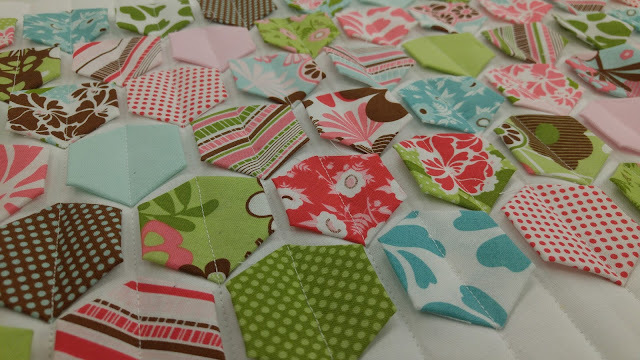 back to making hexies again.....and now I can use one of those charm packs I didnt know what to do with!! These are lovely! All of the bright colors you used are so springy and cheery! Such a wonderful runner! Thanks for the wonderful idea! That is so pretty! I love your photo with the vase of flowers on your runner! 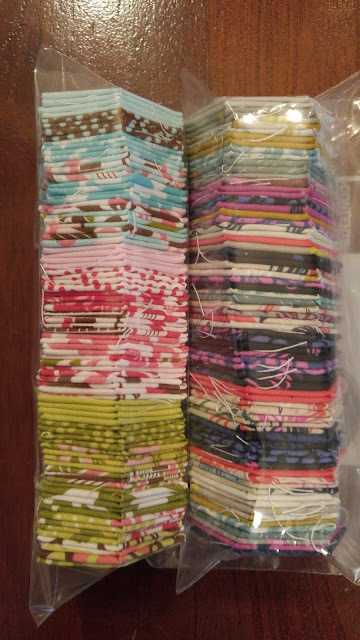 I have a batch of hexies all basted, waiting for me to do something with them - thanks for the inspiration! I just wrote in a comment on someone's blog that I didn't have the patience to do EPP. I didn't think of it that I could avoid the part I didn't want to do--whipping them together--by using machine applique like this. 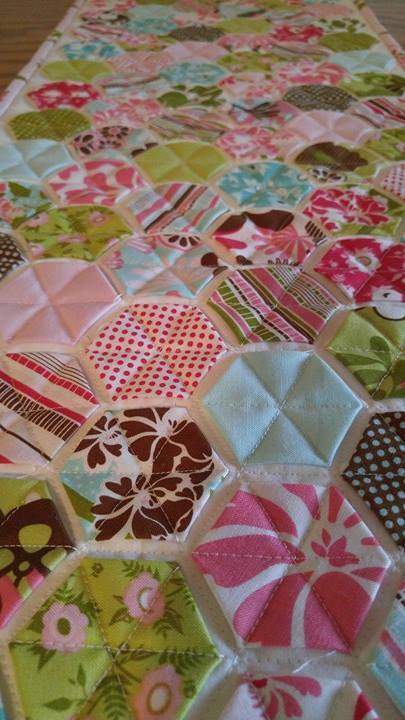 And quilting at the same time. What a neat idea! 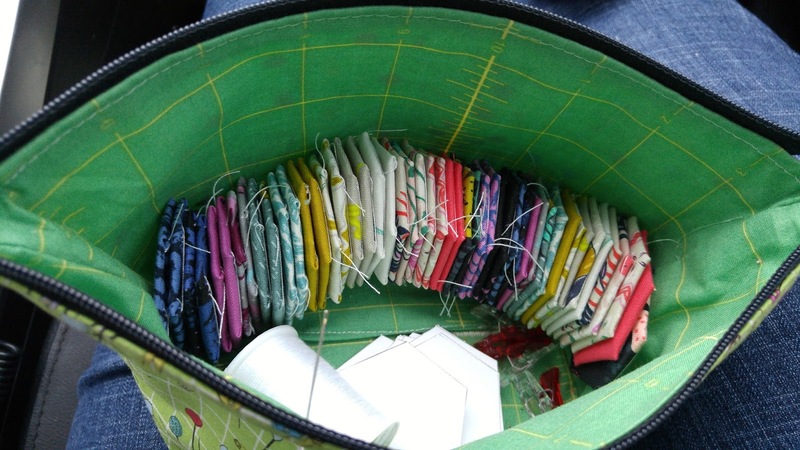 Looks great - and I like the way you attached them to the backing with 3 rows of stitching. What a fantastic idea! I love love love it! BTW, I had an email today from Kona Bay fabrics... they are closing after 26 years. Stock up on your fabrics now! It looks amazing, and beautifully spring like - I love the colours and it's such a pretty textural effect! What a great project to finish for spring. I love how this has turned out and has made me think I really do need to get some spring/Easter decoration in our home. love the table runner and the bright cheery colors. 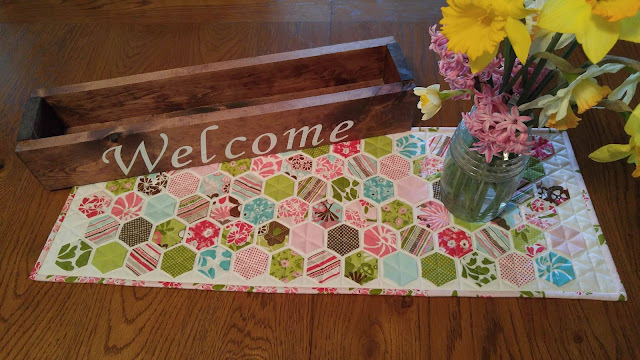 I just finished a table runner myself using the very same method. I really love the texture it gives a project. Using a walking foot is a good idea - I just used a normal foot and had some small issues. 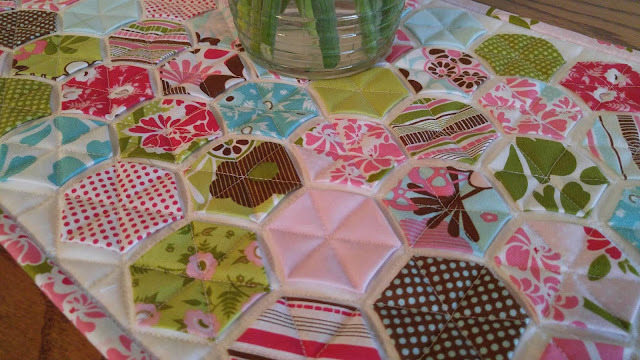 I love the technique of stitching the hexies on top of the quilt sandwich. Other than making sure of the even space in between, it looks like a great project. I am going to give it a try! Trying again. I like it very much but I am concerned about the loose straight edges. Have you washed the runner? How is it holding up? Thank you, Bev! (You're a no-reply commenter so I couldn't reply to you via email.) Projects made using this method wash up really well! 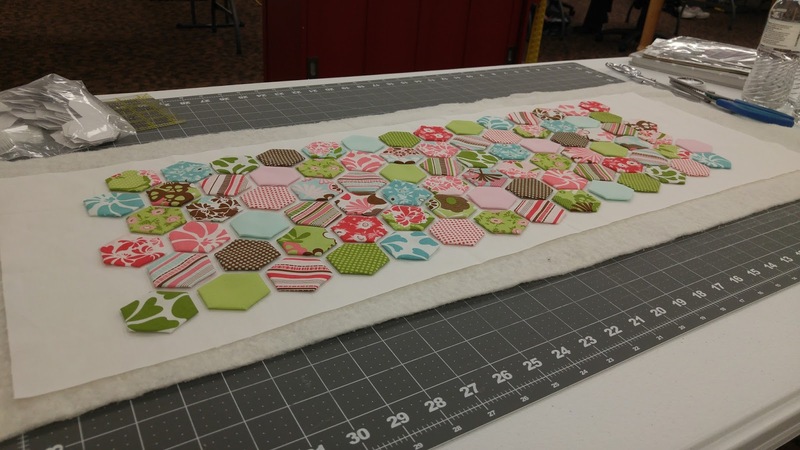 The sides of the hexies are only one inch, and the machine stitching keeps the raw edges folded underneath. The raw edges aren't visible like in raw edge applique. I'm planning a whole quilt using this method soon!